Viperhouse has only been together for the last two years, yet they sound like thay have been together for years. The band has quickly grown from playing local bars in Middlebury and Montpelier to playing jazz festivals throughout North America this past summer. The ten piece band consists Dan Mallach(trombone), Brain Boyes(trumpet), Ray Paczkowski(hammond organ, keys), Karen Quinn(violin), Heloise Williams(vocals), Brett Hughes(guitar), Rob Morse (bass), Phil Carr(drums), P.J. Davidian(percussion) and Michael Chorney(saxophone, conductor). Last week, Viperhouse was able to return to its roots and play at the small restaurant, Tom's Riverside Bar and Grill, in the beautiful town of Bristol, VT. The performance was an opportunity for Viperhouse to give something back to all their local fans. The restaurant was packed to the hilt, but that did not stop anybody from dancing. Nor did it stop Viperhouse from putting on a great performance. The band combined every music element in the book: funk, jazz, acid jazz, soul and bit of country. Even with all these influential components in their music, Viperhouse never strayed from sounding 100% original. When the Viperhouse did a standard cover tune, it somehow sounded like an original. This fact can be attributed to the amazing musical abilities of all ten members of the band. No single musician stood out during the performance as they each displayed their musical prowess. Even with Michael Chorney serving as the band leader and manager, Viperhouse's sound was a sound of equal virtuosity. To accurately describe the Viperhouse style is a daunting task. To make things easier, we stole a description right from the Viperhouse press release: "diverse does not begin to describe the resulting crew. Burlington's most in demand veteran drummer is paired with a wunderkind bassist fresh out of high school. Classical violin meets the sound of the Hammond "3-D." add to this a three piece horn section, Latin percussion, wah-wah spy guitar and the smokin vocals of Heloise Williams and the resultinng chemistry is very, very funky." Before Viperhouse's performance, The Southern Vermont Review caught up with band leader and saxophonist Michael Chorney. In addition to leading the band, Chorney teaches music at Middlebury and lives with his family up in the hills of Lincoln, Vermont. We took the time to discuss everything from the influence of the Sun Ra Arkestra to having Viperhouse's equipment stolen at the Ottawa Jazz Festival. Brian Knight: Could you please describe the genesis of the Viperhouse? Michael Chorney: Ray (Viperhouse's keyboard player) and I were in this jazz band, The So Called Jazz Sextet for three years. It was a really good band but it was totally cutting edge, avant-garde jazz. Really out stuff. We were getting really successful. We had a record out on Accurate Records and we were playing the Knitting Factory ( A New York City Concert Hall) and shows like that. The crowd was getting much more ossified (to become rigid). It was more of these set list avant garde types. Meanwhile, we both played in these different funk bands. We really missed the energy of interacting with a really diverse crowd. So that gig( So Called Jazz Sextet) was drawing to an amicable close and I went to Italy for a while. While I was there, I started to think about the new kind of music that I wanted to make. I drew up a wish list of musicians that I thought would be great to work with. Great musicians, really diverse and capable of dealing with a band situation intelligently so that we wouldn't run into the typical problems that would occur. When I got back from Europe, I called everyone of them and they all said sure. It started off as a side project cause I knew everybody had something going on, but I was secretly hoping that it would move to the forefront. And it did. Within six months it was everybody's priority. BK: What was your first gig as Viperhouse? MC: It was down at Woody's (Middlebury). It was great. It was pretty raw at the point. The difference between The So Called Jazz Sextet and Viperhouse is that I came in at the very first rehearsal, I told all the musicians that I was going to boss. I was going to run the show. I would be making all the decisions. I wanted input from everyone but I would be the one making all the final decisions. I would also take care of all the schlepp(sic) work. There were silent for the first few seconds but then thought it was great. BK: Who would you claim as musical influences? MC: Sun Ra in a huge way. Not as much sonically. Largely in the approach. I saw the Arkestra many times. He was huge inspiration. BK: Do you find any correlation between Sun Ra and Viperhouse? MC: Largely in the way we approach improvisations and even the soloists. Sun Ra had a big orchestra. His soloists weren't the typical "Its your turn, now go!" Everything was always carefully integrated. Every thing was done really well. BK: Was Sun Ra mostly improvisation? MC: No. That is the other thing about our influences. Sun Ra would come out and do completely whacko improvisations. Then they would follow up with a Fletcher Henderson tune from the 1920s. Sun Ra used to play in Fletcher Henderson's group. So the way Sun Ra would mix those two things, by the end of the night, he would have a complete hit. Sun Ra would take jazz pop standards and turn them inside out. Viperhouse does that with Neil Young tunes or Chicago soul stuff. We never try to do it normally. Another Sun Ra influence was that he tried to contour his performance to the situation and Viperhouse does the same thing. The way we improvise is much more suited for a quartet, but there are ten of us. So it is a huge challenge but it is working. It is really satisfying when it takes off. BK: With ten people in the band, do you find it difficult to set up at some places? MC: Definitely. The same thing with Sun Ra. He was always talking about space, you know "Space is the place." Viperhouse just creates the space and does it. We use to play a place in Northhampton called Fire and Water. Thirty people pack the place. We would just cram in there. It is kind of fun that way. Actually, in a lot of ways, we prefer the more intimate shows. BK: Like most Burlington bands, members of Viperhouse have appeared in other local bands. 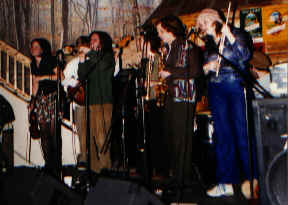 What is your comment on the close knit symbiotic relationship of Vermont musicians? MC: It's like anything. Its got upsides and downsides. All in all, its a pretty good scene. for example, Phil, our drummer, plays in Jusagroove and a lot of that band will come out to hear us and vice-versa. There is a good support element and it is all genuine. That is the good part of it.. There is also a bit of the typical backbiting that goes on, bit I just tend to ignore it. BK: When you and look at the band, Viperhouse appears to be very diverse in styles. What is your opinion? MC: That was very deliberate. In my list of musicians that I chose, the age range was from 18 to 40. That too was very deliberate. I wanted some more seasoned folks who could bring in the experience and I wanted the fresh energy too. That really works. I knew who the horn players were going to be. Ray and I have worked together so long and we are like brothers. We work together really well. I thought about the guitarist for a while. I didn't want typical funk guitar playing. Brett has been absolutely amazing. I think of him as a sound designer on the stage. He uses texture more than anything else. BK: Does Ray use the Hammond when he plays? MC: Yeah, the Hammond M3 which is a keyboard that someone gave him and he rigged up. He gets the most amazing sound. Ray is brilliant. This summer, we unfortunately had some of our gear stolen and he lost his Korg keyboard. He was never crazy about it, but he liked how he could do textures with it. After that happened, we dug out an old Fender Rhodes that was sitting in a dead Rambler in my yard. It was sitting there for years. When we pulled it out, laid it on the driveway, popped the lid off and a half a dozen snakes were in there. BK: Don't tell me he is using it now? MC: He is using now. BK: Do you think you could describe Viperhouse's sound? MC: No. Not well. I have asked to do it a lot. Its difficult to. I hate he word fusion, because what it brings up to me is a lot of clich� fusion of the 1970. Most of that music I really don't have any use for all. Miles stuff was fantastic, but where it all went to was pretty abysmal I thought. (Viperhouse) is a fusion of elements. We draw on as much early jazz as much as anything else. Especially the phrasing and the way we use the horns and the melodies and harmonies. That is in there. Funk's in there .....for sure....and everything in between. We definitely throw in the kitchen sink. Cohesion is paramount with us and making sure that everything has the right stamp on it. When we originally started the band, I wrote all the music, in order to really cement the flavor for all the players. Because I knew there were writers in the band and I wanted them to write for the band, but I wanted it to be real cohesive thing and that worked. BK: It was a summer Jazz Festivals. How was that experience for you? MC: Festival shows are a little funny. You have to get all your information packed into 45 minutes to an hour. That is hard for us. Our shows really want to build and it is really hard to fit them in. Some of them went great. Some of them, we were not pleased with All in all, the reception was fantastic. We went over really well at every festival that we did. BK: Your newest release is a live recording from festival in Ottawa. Was the that one of your better cohesion shows? MC: Ottawa was a great show. We were also really happy with the Flynn Theater (Viperhouse opened for Jimmy Smith during the Burlington Jazz Festival). The Ben and Jerry's Music Festival went well. BK: What prompted you to release the Ottawa Festival on CD? MC: That was the show where we came up the night before and the whole festival staff was wonderful. A hour and a half before the show it was discovered that some of our gear had been stolen which threw a mighty loop for the whole crew. After we got over the original shock, the festival people got stuff so the show could still go on. They ran all around the city getting replacement gear. We went backstage, sat down and we said 'not a word of this to the audience. Do not even hint that anything happened. Lets just go and do the show.' This put everybody into a heightened emotional state. We just went out and really delivered it. We all felt really great about the way we played and how we dealt with it. When we got in the van to drive home, we slipped the board tape in. As we were listening to it, we were surprised by how good the mix was, because board tapes can be often horrendous. We liked it a lot and we decided to package it on tape and try to recoup gear money. It worked. And the response to it have been incredible. BK: Can you describe your audience base? It is this widespread appeal that is the key to Viperhouse's success. No matter your taste in music, Viperhouse has room for you. If it is the instrumental expertise, Viperhouse has the virtuosity. If its dancing, Viperhouse has the beat. If it is the improvisation, Viperhouse has the jam. If its the soulful singing, Viperhouse delivers. Viperhouse has sat on many stages: outdoor jazz festivals, smoky clubs and roadside taverns. No matter the audience or location, Viperhouse is there to put on an amazing performance.